.. updates on tools, data resources and methods to analyze congressional districts and state legislative districts. Join the Congressional District/State Legislative District Group to receive updates. See details. 115th Congressional Districts: bold orange boundary. State house districts: black boundary; yellow label showing code. See related Web section with more detail. .. using GIS resources to create custom 115th Congressional District maps .. use the methods, data and tools described in this section to develop custom congressional district maps. 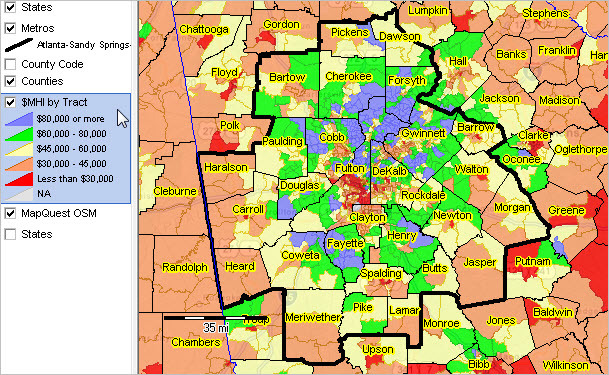 View patterns of economic prosperity by neighborhood for one or all congressional districts. Flexibly associate a congressional district boundary with related geography and subject matter. See related Web section for more details. Join the Congressional District-State Legislative District (CDSLD) Group .. be a part of the community. .. click here to join .. there is no cost. Coming up … mapping/analyzing school district finances in context of the 115th Congressional Districts (June 2017). See the related section on Making/Using 113th Congressional District Maps. .. view different congressional district vintages in same map. This view and related GIS project/data update when changes are made to the 115th Congressional Districts incumbents (last updated 5/10/17). Party affiliation shown in this view is also available in the related interactive table. Click graphic for larger view. Expand browser window for best quality view. – see below in this section about using this GIS project. Use the Geographic Information System (GIS) tools and data to view/show congressional district in context with roads, landmarks and other geography. Flexibly add labels. Create pattern views. Add your own data. The following graphic shows patterns of ACS 2015 median household income (MHI) by 115th Congressional District. Click graphic for larger view. Expand browser window for best quality view. – use the GIS project and tools see below to create different views. The following graphic shows patterns of ACS 2015 median household income (MHI) by census tract in context of 115th Congressional Districts in a region of North Carolina. CD 3712 (Charlotte area) is shown with bold boundary. It is easy to see which areas/tracts have different levels of economic prosperity. – use the GIS project and tools see below to create different views; add other layers. Creating congressional district maps is often specific to a particular analysis, zoom-view, labeling, combination of different geographies or other considerations. While there are no estimates of unemployment by congressional district, using GIS tools it is possible to view/geospatially analyze patterns of unemployment within congressional district by county, census tract, block group and other geography. .. interpretative data analytics; tools, data & methods .. this section is focused on 115th Congressional District geographic, demographic and economic patterns and characteristics. Use tools and data reviewed here to examine/analyze characteristics of one congressional district (CD) or a group of CDs based on state, party or other attribute. Use the GIS resources described here for general CD reference/pattern/analytical views, to examine current demographics and demographic change and for redistricting applications. See this related Web section for more details. • the 115th Congress runs from January 2017 through December 2018. .. some 115th CDs have new boundaries compared the 114th CDs. • view, rank, compare CDs using the interactive table. .. table uses ACS 2015 data for 115th CDs & include incumbent attributes. .. examine districts by party affiliation. .. data based on 2015 American Community Survey – ACS 2015. .. corresponding data for the 115th CDs from ACS 2016 available Sept 2017. • use the new GIS project including 114th & 115th CDs described below. .. examine CDs in context of other geography & subject matter. The following views 1) provide insights into patterns among the 115th CDs and 2) illustrate how 114th to 115th geographic change can be examined. Use CV XE GIS software with the GIS project to create and examine alternative views. The following graphic shows North Carolina CD 12 with 114th boundary (blue) and 115th boundary (pale yellow) and Charlotte metro bold brown boundary. Click graphic for larger view with more detail. Expand browser window for best view. .. view developed using the CVGIS software. • View zoom-in to Charlotte city & Mecklenburg County. Use the interactive table to examine characteristics of one congressional district (CD) or a group of CDs. The following graphic illustrates use of the interactive table. First, the party type was selected, Democratic incumbents in this example. Next, the income and educational attainment columns were selected. Third, the set of districts were sorted on median household income. It is quick and easy to determine that CA18 has the highest median household income and that the MHI is $1,139,900. Try using the table to examine districts of interest. .. what would be the financial impact of a one-percent understatement in the Census 2020 population count? Many political districts are drawn based upon population change and shifts, and allocations of government funding and services are made based upon official population data. Consider this one specific example. For each one-percent of the Atlanta MSA population missed in Census 2020, potentially due to less than fully accurate address and location data, the financial impact could be on the order of $414 million per year. How and why? At margin, each person not counted in the decennial census results in a per capita disposable income loss for the area in the magnitude of $5,494 in 2000, and $6,770 per person in 2020. 61,100 people undercounted times $6,770 yields $414 million. This section is about the Censue 2020 Local Update of Census Addresses (LUCA) program and how it might impact the reduction in undercount .. and make the data more accurate for wide-ranging needs and uses. Read on for details about the LUCA program. The Atlanta metro shown with black bold boundary. More about this metro. – Click graphic to view patterns of neighborhood economic prosperity. Financial Impact Details … the 2015 per capita current transfer payments (PCTP) in the Atlanta-Sandy Springs-Marietta MSA were $6,132, up from $5,494 in 2010. The PCTP figure in 2020 may be $6,770. For each one-percent of the Atlanta MSA population (61,100 people) missed in Census 2020, potentially due to less than fully accurate address and location data, the financial impact could be in the order of $414 million (61,100 x $6,770) per year as of Census 2020. $414 million per year based on the 2020 population and PCTP. The Census 2020 LUCA program is an initiative of the Census Bureau, partnering with thousands of state and local governments across the U.S. At the core of this program, Census provides address list data to communities; those communities compare those data with their own data and provide address/geographic updates back to the Census Bureau. The updated address and geographic data are integrated into the TIGER/Line files — geographic backbone for collecting and tabulating the Census results. This important MAF/TIGER address-plus update program will help insure improved accuracy for Census 2020. LUCA is a geographic data development program engaging local communities across the U.S.
ProximityOne works with local areas to improve the TIGER/Line files leading up to Census 2020. Using the CV XE GIS software and specialized expertise, we helped hundreds of governmental units, including all of the State of Georgia, improve the coverage and content of the TIGER/Line files and thus the accuracy and completeness of Census 2010. The Census 2020 LUCA program is starting now in 2016. See the full schedule and related details in the LUCA Web section. .. congressional districts vary widely in demographic-economic characteristics. We have new data for 2015 providing insights to characteristics of the 114th Congressional Districts. This section summarize a few of these characteristics and provides access to a wide range of data that you can use to view, sort, rank, and compare congressional districts using interactive tables. The following graphic shows patterns of educational attainment (percent college graduate) by congressional district in the Los Angeles area. White label shows the congressional district code; yellow label shows percent college graduate. Legend shows color patterns associated with percent college graduate intervals. – View developed using CV XE GIS software and associated GIS project. Reference items refer to items/columns shown in tables described below. .. general demographics: congressional district UT03 has the smallest median age (27.5 years — item D017) and FL11 has the highest median age (53.5 years). .. social characteristics: congressional district KY05 has the fewest number of people who speak English less than “very well” (2,676 — item S113) and FL27 has the largest number (281,053). .. economic characteristics: congressional district ND00 has the lowest unemployment rate (2.6% — item E009) and MI13 has the highest unemployment rate (14.6%). .. housing characteristics: congressional district MI13 has the lowest median housing value ($63,100 — item H089) and CA18 has the highest median housing value ($1,139,900). Click a link to view more thematic pattern maps and use the interactive tables. .. essential data to assess where we are, how things have changed and how things might change in the future down to the sub-neighborhood level. The American Community Survey (ACS) is a nationwide survey designed to provide annually updated demographic-economic data for national and sub-national geography. ACS provides a wide range of important data about people and housing for every community across the nation. The results are used by everyone from planners to retailers to homebuilders and issue stakeholders like you. ACS is a primary source of local data for most of the 40 topics it covers, such as income, education, occupation, language and housing. ProximityOne uses ACS to develop current estimates on these topics and 5-year projections. This section is focused on ACS 2015 data access, integration and use and is progressively updated. New ACS 2015 1-year estimates are available as of September 15, 2016. Oil prices plummeted in late 2014. How has this affected people and households in areas hardest hit? Find out for wide-ranging geographies using the ACS 2015 1-year estimates. Compare to ACS 2014 1-year estimates. Use the ACS 2016 1-year estimates (September 2017) to see how the impact has continued. Demographic-economic conditions change for many reasons; oil price changes are just one. • Updates are sent to ProximityOne User Group members (join here). … access special extract files and GIS projects available to members. • ACS updates and applications are covered in the Data Analytics Blog. • ACS data access, integration & use … join us in a Data Analytics Lab session. Organized on a state-by-state basis, use tools and geographic, demographic and economic data resources in these sections to facilitate planning and analysis. Updated frequently, these sections provide a unique means to access to multi-sourced data to develop insights into patterns, characteristics and trends on wide-ranging issues. Bookmark the related main Web page; keep up-to-date. Knowing “where we are” and “how things have changed” are key factors in knowing about the where, when and how of future change — and how that change might impact you. There are many sources of this knowledge. Often the required data do not knit together in an ideal manner. Key data are available for different types of geography, become available at different points in time and are often not the perfect subject matter. These sections provide access to relevant data and a means to consume the data more effectively than might otherwise be possible. Use these data, tools and resources in combination with other data to perform wide-ranging data analytics. See examples.